When hockey star Caleb Carter returns to his hometown to recover from an injury, the only thing he’s interested in is a little R & R. He never expects to run into his onetime crush at a grade school fund-raiser. Seeing Aaron Price hits him hard, like being checked into the boards. The attraction is still there, even after all these years, and Caleb decides to make a play for the schoolteacher. You miss 100 percent of the shots you never take, right? This is a proper romantic fantasy – a famous hockey player falls for a small-town teacher. As with all Dreamspun Desires stories, both Caleb and Aaron are perfect leading men – if a little bit too good to be true. The famous professional hockey player is humble enough to donate his time and money to an elementary school charity event. He cares for his sister and still holds a torch for his high school tutor. Aaron is a selfless, dedicated teacher who devotes himself to his students. They are both sweet and heroes in their own way. These two are almost too perfect together. Between romantic dinners, coaching hockey together, and stolen kisses by a frozen pond, these two are fairytale sweet. Theirs is a pure sugar rush romance full of all sorts of good feels. Because they fit so well as friends and lovers, the very minimal conflict in this story seems slightly contrived. Aaron doesn’t think the distance between Caleb’s New York team and his own job in rural New York is workable. He doesn’t think he fits in Caleb’s world and he is worried about Caleb’s travel schedule. This is very much a Dreamspun Desires story. It’s a simple, very sweet, low heat romance. It’s supposed to be predictable and very low angst. I really enjoyed the characters in this story and it is beautifully written. JEFF ADAMS has written stories since he was in middle school and became a gay romance writer in 2009 when his first short stories were published. Since then he’s written several shorts and novels and he plans to keep writing as long as wonderful readers keeping picking up his books. Jeff lives in rural northern California with his husband of twenty years, Will. Some of his favorite things include the musicals Rent and [title of show], the Detroit Red Wings and Pittsburgh Penguins hockey teams, and the reality TV competition So You Think You Can Dance. If forced to pick his favorite book, it would be a tie between Michael Chabon’s The Amazing Adventures of Kavalier & Clay and David Levithan’s Every Day. Jeff is the co-host of Jeff & Will’s Big Gay Fiction Podcast, a weekly show devoted to m/m romance as well as pop culture. New episodes come out every Monday at biggayfictionpodcast.com. WILL KNAUSS is a child of the seventies. When he wasn’t twirling around on the playground (like Lynda Carter from Wonder Woman), he wrote stories and performed plays for family members. Enthusiasm for his theatrical presentations varied. Before becoming an author, Will’s work experience ranged from hotel housekeeper to retail clerk. While living in New York, he even worked as a Wax Museum tour guide. In 1995 he asked the man who would eventually become his husband on a date. No Netflix and chill for them, though, remember, this was the Dark Ages (aka the midnineties). They went to an actual theater to see the John Carpenter remake of Village of the Damned. They have been inseparable ever since. Each week, Will shares his love of gay romance fiction with the listeners of the Big Gay Fiction Podcast, a show he co-created with his husband and fellow author, Jeff Adams. Other random facts: He loves Jacqueline Susann’s Valley of the Dolls and Armistead Maupin’s Tales of the City. He can answer any question about Bette Davis (he’s that obsessed) and has an ever-growing collection of Wonder Woman ephemera (see Lynda Carter reference above). 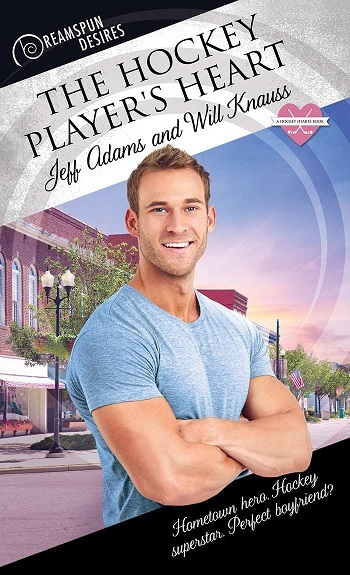 Reviewers on the Wicked Reads Review Team were provided a free copy of The Hockey Player's Heart (Hockey Hearts #1) by Jeff Adams & Will Knauss to read and review.